State leaders in New Hampshire say the heroin crisis is likely being fueled by the over prescription of pain medications and now the Attorney General's office has launched an official investigation into the marketing practices of large pharmaceutical companies. Attorney General Joseph Foster says this is a matter of consumer protection. Now, his office wants to know if big pharma companies are misleading doctors and patients with bad information about the addictive side effects of their medications. There was a wave of purple on the State House lawn Tuesday. Each of the more than 550 flags represented a Granite Stater who died from an overdose since January of 2014. Concord resident Donna Marston feels lucky her son was not represented there. She says he was a heroin addict as a teenager and young adult, but is now seven years clean. "He took what was a pretty shattered life and he is a highly productive functioning human being," Marston said. She doesn't know exactly how her son fell victim to the drug, but officials say many people start with an addiction to prescription pain medication. "They lose ability to acquire them lawfully," said Attorney General Foster. "On the street, one opioid pill is way more expensive than a hit of heroin and they often turn to heroin." Foster says 20 years ago, opioids were considered dangerous and highly addictive and weren't commonly prescribed. His office is now investigating why that's changed. Foster says evidence shows pharmaceutical companies could be deceptively minimizing the risk of addiction while exaggerating the benefits. "It could fall under a consumer protection matter," Foster said. "We're looking at other state laws to see if any would be broken." 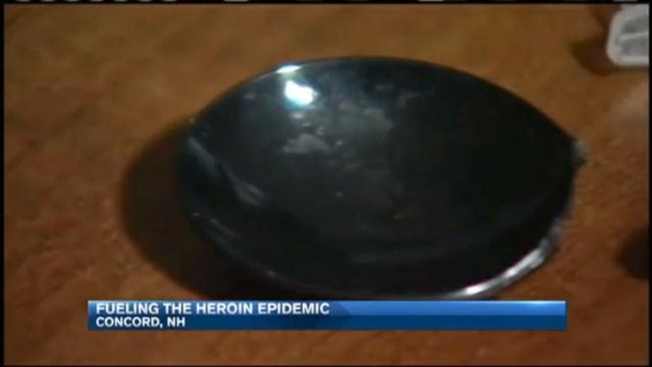 Also Tuesday, Governor Maggie Hassan announced that the state will be distributing more than 4,500 hundred life-saving Narcan kits to friends and families of those at risk of overdosing. "We can now have it in our homes is huge," Marston said. "It's going to save lots of lives." Foster says there are similar investigations in Chicago and in some municipalities in California, but this is the first of its kind in New England.